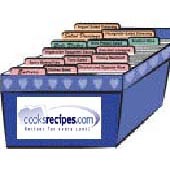 Recipe for lemon bars - submitted by Jim McElhone. Position rack in lower third of oven and preheat oven to 350°F (175°C). Spray a 13x9x2-inch pan lightly with vegetable oil spray. Make the crust: Stir the 3/4 cup of flour, the cornmeal, salt and baking soda together with a whisk to combine. Set aside. In a medium mixing bowl, beat the butter until creamy. Add 1/3 cup of the sugar and beat at high speed for about one minute or until mixture loses its crumbly texture and begins to form a mass. Beat in the egg yolk, yogurt, and vanilla. Add the dry ingredients and beat on low speed just until combined. Scrape the bowl and beater. Knead the mixture briefly with your hands to mix thoroughly. Make the topping: Whisk eggs and the egg white with the remaining sugar until combined. Whisk in the lemon juice and zest. Whisk in the 1/4 cup of flour. When crust is brown, turn oven temperature down to 300°F (150°C). Pour topping over hot crust and bake 15 to 20 minutes, or until topping barely jiggles in the center when you shake the pan gently back and forth. Cool on a rack. Chill before cutting into squares. Serve cold or at room temperature (I like them cold) dusted with powdered sugar. They last a couple of days but are most delicious on the day they are baked. Do not freeze.